"When the sky clears in Powell River, you can see the snowpack all around, but you can't get to it. Mount Mahony is the exception. 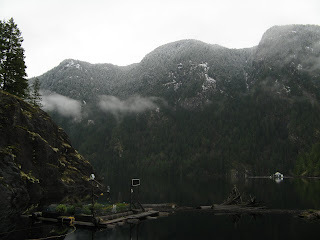 The dirt road, only a few miles outside town, climbs steeply..."
Wayne featured "Mount Mahony" in the first chapter of Up the Lake. 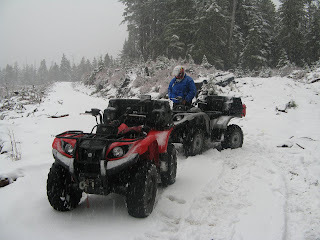 I've been there once, but Wayne and I only took our quads a little ways up the mountain. Today we did the whole thing, with our friend John and his dog Bro in the lead. We are always more confident that way. It was still overcast in Powell River. 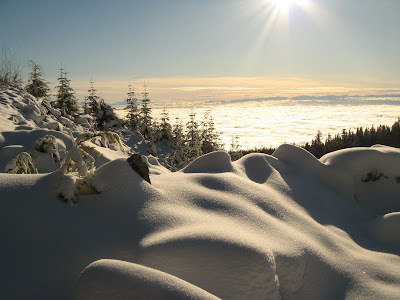 As we climbed higher and higher, we finally broke through the freezing mist to the sunshine promised for today. The snow on the trail got deeper and deeper and the overarching alders did their best to dump their load on our heads as we passed underneath. John takes the worst of it in the lead, but Bro in his aft quad box gets quite a dose. Each time we thought we could go no further, John pushed through and made a trail for us to follow. We made it all the way to the bluffs and their panoramic lookout, but today's low lying clouds hid Inland and Powell Lakes from view. 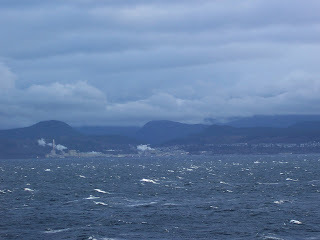 Texada and Vancouver Islands poked their heads through, but the rest of the coast remained shrouded in gloom. Sandwiches and pop taste as good as lobster and champagne when you are in such a beautiful place. On the way down we hiked a few hundred meters up a side trail to a tranquil lake in the process of freezing. Sometimes it is hard to believe that Powell River has such wonderful places to explore so close to town. 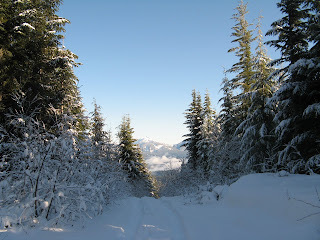 Even though we saw several cars and trucks along the way, we had the trails and snows of Mount Mahony all to ourselves. Crisp fall days bring crystal blue skies and magnificent reflections. 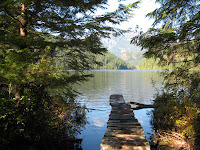 On a recent quad ride we followed Goat Lake Main along the chain of lakes that make up the Powell River Forest Canoe Route. One thing we like to do while quadding is to stop and hike farther into the bush. You don't have to go far to find some spectacular places. 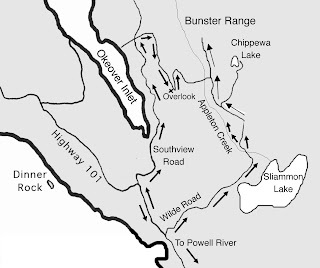 We stopped between Dodd and Windsor Lakes and followed the portage trail to the head Windsor. It's a little hike, but the vistas are huge. Be sure to look both up and down. Some of the most beautiful things are right there at your feet. This particular location can be accessed on weekends by truck, or even a car if care is taken while driving on the logging roads. You don't have to wait until summer to enjoy this ride. 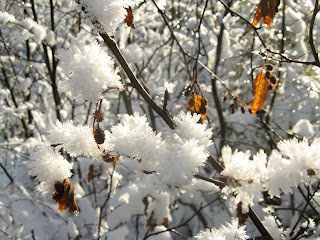 A sunny winter day, even a foggy one, brings beautiful things to see. 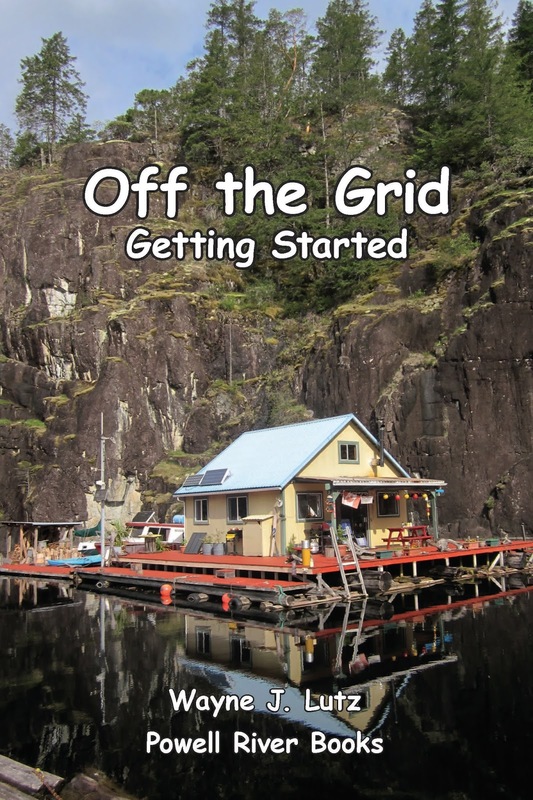 We use our woodstove 24/7, so why waste all that heat. The best time for baking is when we first get back from town. A roaring fire gets the cabin warm and toasty, and bakes a yummy pie at the same time. 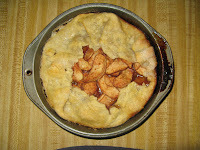 For this simple pie I used my cast iron dutch oven on top of the stove. 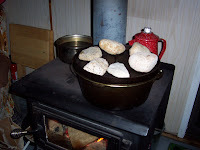 I also used some heated rocks on top for better browning. Mix flour and salt. Cut in shortening until the mixture looks like course meal. Sprinkle water over the mixture a tablespoon at a time and mix. Use only enough water for the pastry to hold together when pressed into a ball. Roll out the dough on a lightly floured board. Rough edges are not a probelm. They add to the rustic look. 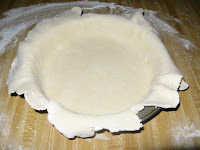 Press the dough into a pie pan. Mix sugar, corn starch, cinnamon and nutmeg and toss with apples. Spoon into the unbaked crust. 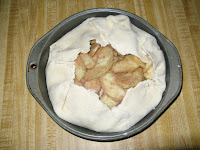 Fold extra crust over the edge of the apples to seal in the juices. Brush the crust with egg and sprinkle with sugar. Bake in a preheated dutch oven. I used my new thermometer and it registered about 300 degrees inside. The first 40 minutes are on a rack 1/2" above the bottom of the dutch oven. Then raise it on a 3" rack for 40 minutes more. Crack the lid to let steam escape for the last 60 minutes. Your time may vary. If you are using a conventional oven, bake at 425 degrees for 20 minutes or until the apples are bubbling and the crust is brown. 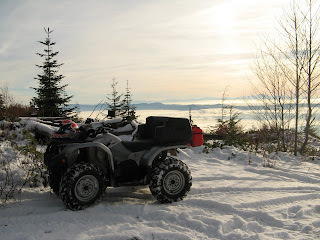 Today was a foggy day in town, but up in the bush on our quads it was gloriously sunny. We didn't have to go too far to get into the snow again. This time we went with our good friend John, his dog Bro and two of his friends. 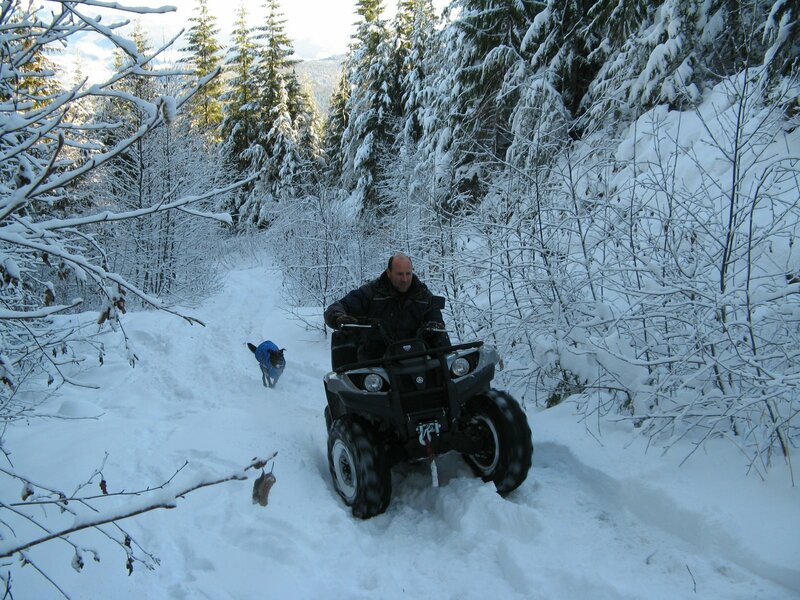 We love riding with John because he really knows the logging roads and trails. There are very few places in the area John hasn't already explored, more often than not, many times. Today he took us up towards Granite Lake, but before we reached the lake we headed into the high country to get some outstanding views of the backcountry. 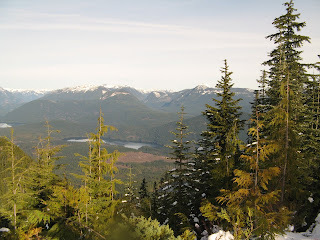 Our first stop was at an overlook where we could see the chain of lakes that make up the Powell River Forest Canoe Route. In the background was snowcapped Mount Freda. On the way back we found a viewpoint on the other side that gave panoramic views of the Strait of Georgia with Texada in the foreground and Vancouver Island beyond. Because of the fog and low clouds over the water, it made for an interesting sight from our vantage point in the sunshine above. November is notorious for strong storms blowing through coastal BC. 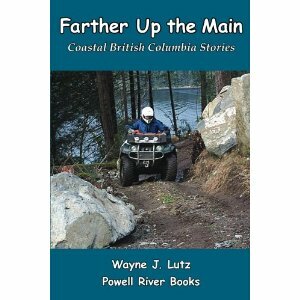 They come in wave after wave across Vancouver Island and blast through Powell River and up the arms of Powell Lake. They start as an Aleutian Low that winds up in the Gulf of Alaska then drops down the coast. If you watch the forecast on The Weather Network you see them spinning south and east with their isobars packed so close you know it's going to be a nasty one. Last Monday was the first major storm of the season. Rain and wind began in the evening, but on Monday morning the worst winds hit. At the Powell River Airport they were clocked at 124 kilometres per hour (116 is hurricane force). You know it's a bad blow when the Texada Ferry doesn't make one of its scheduled runs. We were at the cabin. Sunday night the winds were pretty strong, gusting down our chimney pipe. But at 11:00 a.m. I was looking out the sliding glass door and saw water spouts swirling up through First Narrows. In between the spouts, sheets of water were driven 500 feet into the air. It was scary to watch, but then one of the spouts turned and headed straight for our cabin. 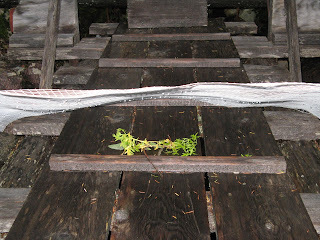 When it hit, it dragged a heavy sawhorse off the deck and ripped the mooring ring for our boats right out of the deck. While we braved the elements to save our boats, we had to sadly watch our precious sawhorse float away in the storm tossed water. 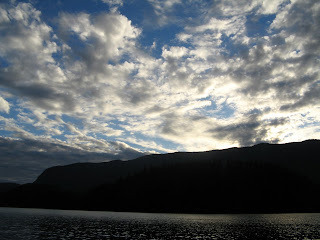 A few hours later the front passed and the skies cleared bringing a respite with blue skies and much needed sun. Yesterday was another weather first, the first snow on Goat Island. The storm during the night brought heavy rain on our metal roof, but thankfully no wind. When I got up, the first thing I saw was a light dusting of snow on Goat. By the end of the day it was mostly melted, but a memorable event nonetheless. As John says, "When it's snowing up above, it's raining down below." Well, today we figured the reverse must be true. It's a Saturday and the logging roads are open for the public to use. We've been listening to the weather forecast for days and came down from the cabin because it was supposed to be partly sunny. Well, we woke to gray skies. Still hopeful, we went to the airport to get our quad trailer out of the hanger. By the time we were all hooked up and ready to go, the drizzle started. What to do? Well, we remembered John's saying so we decided to pick a destination where we could ride in the snow. Our choice was to go north of town to Wilde Road and head up to the Bunster Hills. 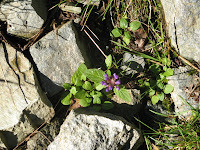 We have been there several times before in both summer and winter. I remember well one winter trip in my truck. 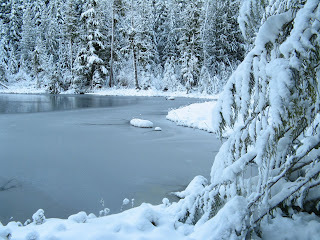 It was so memorable that Wayne wrote a story about it, "The Truck Got Stuck" in Up the Winter Trail. We parked our truck and quad trailer in a wide turnout just past a tree that fell almost across the road during the last wind storm. It seems like this area really gets hit hard by the winds. The first part of our ride was in a light rain, but in about 10 klicks it changed into snow. Even though we were in our rain gear, that made the ride more pleasant. It took another 2 klicks before we could see the snow starting to stick on the ground, but then it rapidly started to build. The last 3 klicks were in several inches of snow, but our tires handled it well. Then all of a sudden, there was too much and we had to turn around. Something started invading my floating garden and was "harvesting" what was left of my crops. It was a strange sight. 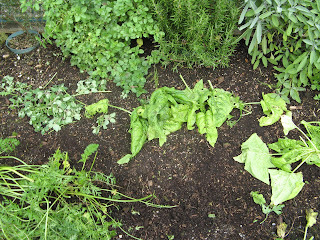 There were small piles, all categorized by crop. Parsley was piled with parsley, spinach with spinach, carrot tops were with carrot tops, and strawberries with strawberries. Such a neat farmer. But what could it be? Yes, I did leave the garden tethered to our transition float one night, but after that it was in its floating position along the breakwater. No animals were evident in the garden and I wasn't sure one could live under the float since it rides pretty low in the water. Yet, several nights a week more piles would appear. I went to Rainbow Valley Pet & Farm Supplies on the corner of Manson and Duncan Streets. The proprietor listened to my description and thought it might be a weasel. I've neven seen one around the cabin, but it was possible. My vote was on a Woodrat (Packrat) or squirrel, both of which I've seen around our place. He recommended a weasel trap, but it was pretty big. I decided on the Havahart 0745 live trap for squirrels, rats and chipmunks. The first night Wayne loaded it up with peanut butter as bait. It was sprung the next morning, but nothing was inside. The second night we had success. 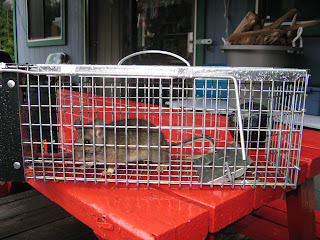 A Bushy Tailed Woodrat (Packrat) was nervously resting inside our trap. The Woodrat is the only rat native to Canada. It eats leaves and seeds (and garden veggies). They live on cliffs (we've got a big one of those) and in abandoned buildings (our shed isn't abandoned but it's pretty quiet). A Woodrat is a large, gentle, squirrel-like rodent with soft grey and light brown fur. Its large eyes and ears, and bushy tail make it easy to identify. 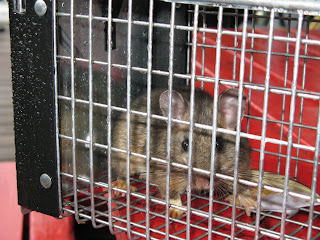 Yep, that's a Woodrat in my cage. The descriptions don't mention anything about swimming, but this one must have been crossing between our transition float and the garden to return with tasty morsels to store in its midden for the winter. At least there was evidence of this on our walkway to shore one morning. In addition to storing food, Woodrats are notorious for taking and hiding bright shiny objects. 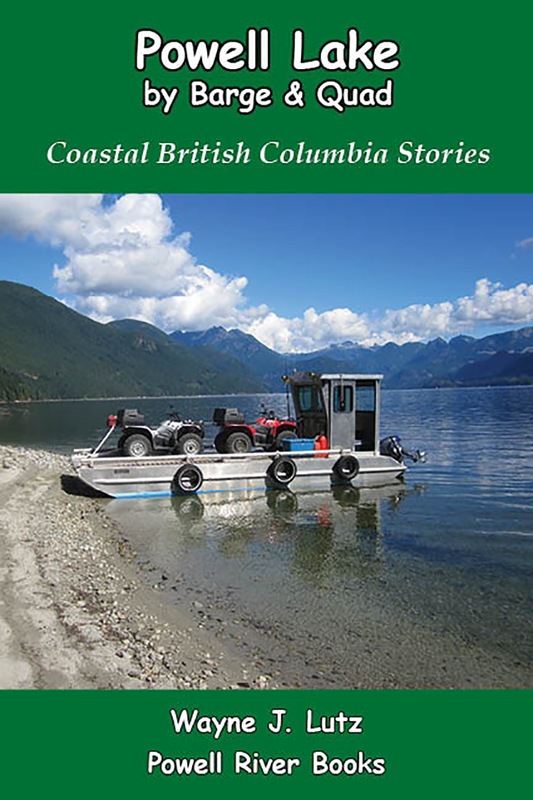 Wayne took him (or her) for a ride in our tin boat to a distant cliff to start a new life. The next night we put the cage on our front deck. There was evidence (droppings and nibbled flowers) that someone was hanging out there as well. Just as the sky began to lighten, we heard the cage rattling. 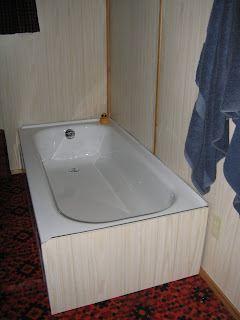 When Wayne asked if I thought it was crazy to put in a bathtub at our cabin, I said of course not. In summer, a dip in our "swimming pool" in Powell Lake does the trick, but in the fall, winter and spring (most of the year for that matter) the lake is too cold. In fact, by November the water is bone chilling. We started looking for a used bathtub. After a month it was evident that in our small community a used tub isn't something that comes on the market very often. Then we got creative. What if we could use an old canoe, cut it in half and make a tub out of that? It was an appealing idea. It would really go with the atmosphere of a rustic cabin. Yes, there were canoes for sale, but they weren't old beaters and the prices were out of the question. One day we were walking through Powell River Building Supply (Rona) and there was an enameled steel tub on sale. Because we wouldn't be installing it in a normal manner, we needed a rigid tub that would support our weight. We picked it out, but left the installation to our friend John. Now, instead of a twin bed that we never used, we have a bathtub that we will. There aren't any faucets, but the drain is pretty simple. Pull the plug and scoot back. The water whooshes down the pipe and under the float. 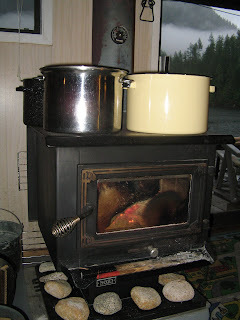 To get hot water we fill four big pots and heat them on top of our wood-burning stove. We are always trying to find ways to use the excess energy that it generates. Four pots of hot and two of cold give a nice water level in the tub for a warm and relaxing soak. So thanks Wayne, for a great idea and a little bit of luxury in our simple home. 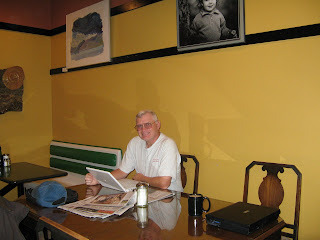 Rocky Mountain Pizza and Bakery is one of the great restaurants available on Marine Avenue in Powell River, BC. It's location makes it a good destination for people waiting in the lineup at the Westview Terminal waiting for a ferry to either Texada Island or Comox on Vancouver Island. Just walk up Wharf Street to Marine and hang a left. 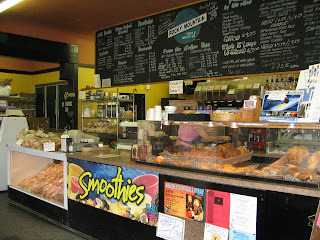 It's also a favorite breakfast or coffee break stop for locals, and a good place for lunch or a pizza dinner. What's good to eat? For breakfast my favorites are a scone (they're huge) or a cinnamon roll. The coffee is fresh, hot and rich. Sometimes, for a change, I get a latte instead. They bake their own bread. You can buy it by the loaf, or get it in a sandwich with a bowl of soup, or take it to go. When we go quadding that's what we do. A roast beef with all the trimmings on multigrain sure tastes good while taking a break from riding on the top of a mountain. When I don't feel like cooking (almost every night), it's a great place to get a pizza. Need to use a computer or the Internet, they've got that, too. There are several PCs available for a small fee. That's handy for people passing through who just need to grab a terminal to get their e-mail. They also have a free wireless hotspot if you want to bring your own laptop. Head for the back room if you want a room with a view, and a computer too. 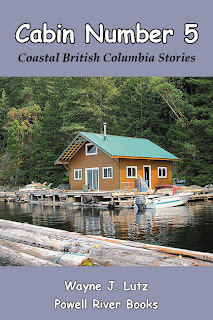 For the second year in a row, Powell River Books was nominated for awards for our excellence in business. What an honor. We ARE small but mighty!! 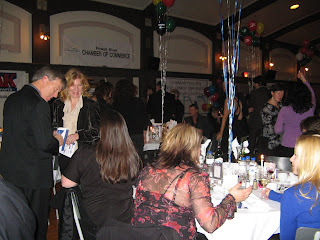 The Powell River Chamber of Commerce, Community Futures Development Corporation of Powell River and the PEAK newspaper annually sponsor the Horizon Business Awards. Everyone in the community has the opportunity to nominate businesses in a variety of categories when the PEAK runs full page nomination forms each fall. Nominees are then invited to an awards dinner held at the historic Dwight Hall in the Townsite. 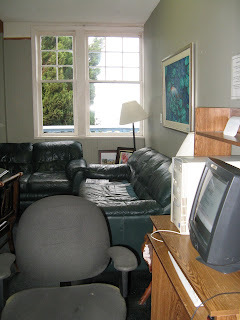 It is a wonderful part of the history of Powell River. You can just sit there an imagine all of the balls and banquets from the heydey of the mill after the turn of the century. 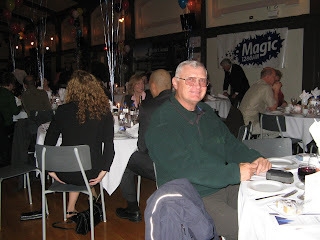 And there we were, listening to Dave Formosa, the president of the Chamber and other dignitaries, waiting to hear the results. This year we were nominated in the categories of Tourism and Home-Based Business (last year it was New Business of the Year and Tourism). We had our name in the program and heard it announced from the podium twice. That's an award in itself. Some of the awardees for this year were Westview Agencies as Business of the Year and Plutonic Power as Large Business of the Year.